I had our Hudson on July 17th. He had open heart surgery 10 days later and then liver surgery in September. Hudson has several challenges which have not allowed him to leave the CICU yet. He needs another open heart surgery in the coming months. He needs to grow before scheduling that. We are from North Carolina and had to come to CHOP in an emergency. I have not been home since July. My job has worked with me thus far but they need me to physically come back to work or resign. This is our only income and source of insurance as my husband has already lost his job. I need to go back to work next week. Our challenge will be that I will need to travel to North Carolina for work and then come back to Philadelphia as much as possible (hopefully weekly). I know you understand the kind of stress and pressure we are under. Thank you for considering being part of Hudson’s story. 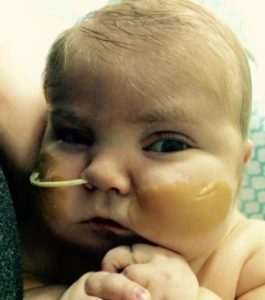 It is with great sorrow that we report that Hudson earned his angel’s wings on April 5th, 2016. Rest in peace, beautiful Hudson.